A friend wants to convert her front yard to a native wildflower meadow. Would be great as a xeriscaped yard that also requires less mowing and it would provide beneficial flowers for pollinators. After weeks of calmly delivered, persuasive statements where the couple stood firm, citing their Charter rights and explaining their environmental goals, the City of Ottawa ultimately withdrew the bylaw violation. Their case attracted Will Amos, director of the University of Ottawa’s Ecojustice Environmental Law Clinic, who offered his legal services pro bono. Former councillor Clive Doucet lent support—as did roughly a hundred organizations and individuals. Toronto’s Douglas Counter created a tall-grass-prairie habitat garden featuring more than 80 native species. It evolved into a storm-water infiltration garden on the adjacent city boulevard. When neighbours complained, he took his case to court—and won. For those in Ottawa, they should take note that the Property Standard by-law is still in force and it might help if you enlist neighbors support before you convert. 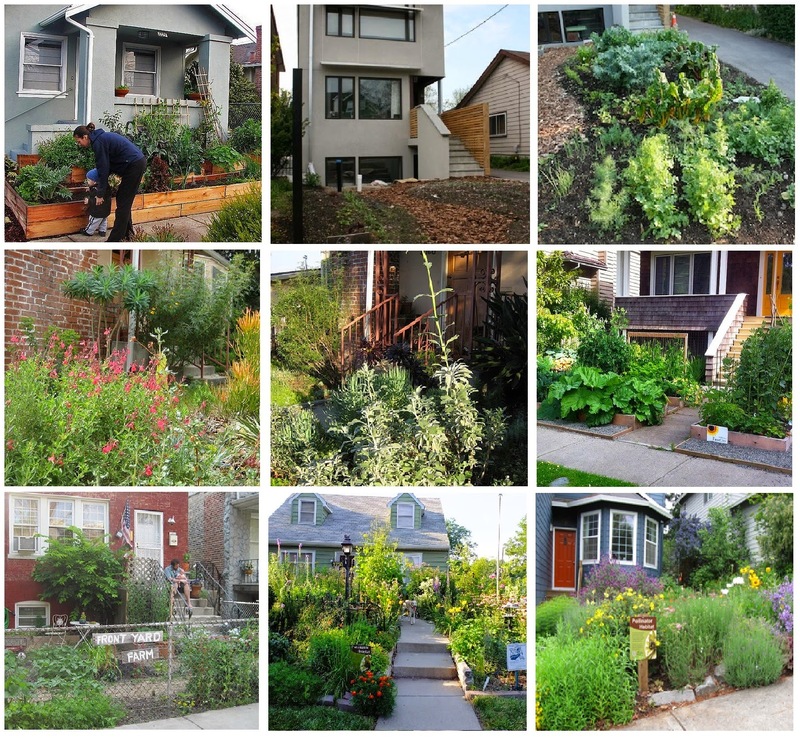 These property standards can also be used to ban front yard food gardens. (3) Heavy undergrowth shall be eliminated from the yard so as to be consistent with the surrounding environment. (4) A yard shall be cultivated or protected by ground cover, which prevents the erosion of the soil. (5) A tree or other plant, or limb or branch of it, that is dead, diseased, decayed or damaged shall be removed from the property or otherwise pruned to remove the dead, diseased, dying or dangerous portions of the tree or plant so as to prevent an unsafe condition or damage to any building subject to the provisions of By-law No. 2009-200, the Urban Tree Conservation By-law. (6) Lawns shall be kept trimmed and not be overgrown or in an unsightly condition out of character with the surrounding environment. (7) Subsection (6) shall not apply to yards which have been landscaped or maintained with materials such as: (a) trees, shrubs, ornamental grasses or flowers; (b) decorative stonework, walkways or screening; (c) any other horticultural or landscape architectural elements. 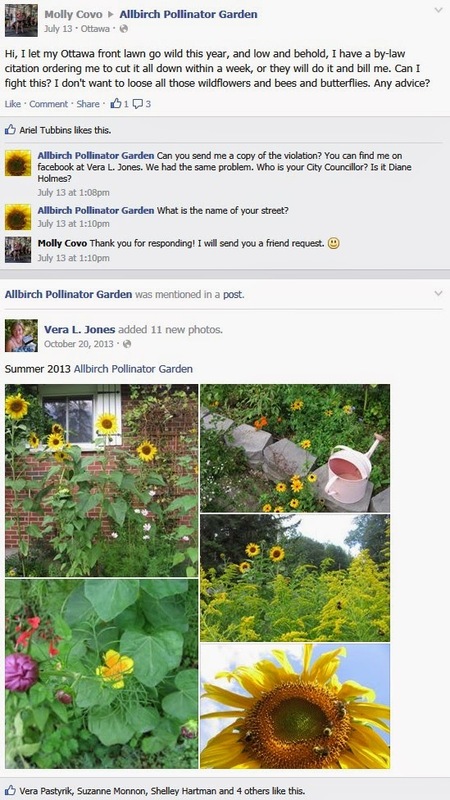 Seems like it is still a case-by-case issue in Ottawa as shown by this Facebook post from the Allbirch Pollinator Garden page this summer (2014). JANUARY 2017 UPDATE _ Found a Toronto website that talks about this issue also - by-laws - what is native, etc.